Walk down Köpenicker Chaussee, past Club Sisyphus, into an industrial area that looks like an abandoned cold-war nuclear facility. When you see the alien spacecraft, you’ll know you’ve arrived at the Funkhaus, a mysterious one of a kind landmark of Berlin music culture. The Funkhaus is not an all-night disco - funk means radio in german– rather, it’s a colossal East German structure that used to be the largest radio-broadcasting site in the world. Think of it as the BBC of the DDR. After the fall of the wall, and despite a series of ambiguous ownership since the 90's, the Funkhaus maintained its relevance renting out its numerous studios to artists. Today the facility is a treasure trove for musicians, sound designers, producers, film directors, performance artists, and a great resource for anyone interested in Berlin history or architecture. The Funkhaus was built in 1951 at a time when Berlin was carved up by Allied powers. East and West Berlin had just begun a decades-long competitive tradition of who could make their part of the city look more prosperous. Radio was emerging as a battleground for political ideology and the Deutsche Democratic Republic needed a way to compete with broadcasts coming from the West. A recording session - July 1970. 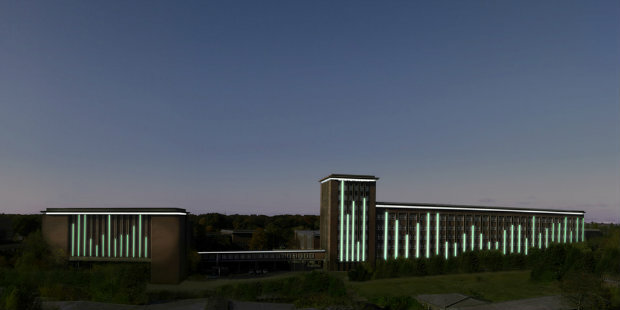 The DDR chose famous Bauhaus architect Franz Ehrlich to lead the design of a massive new broadcasting center. As a communist Ehrlich had spent half of the previous decade as a prisoner of the Third Reich, forced to build entryway arches to concentration camps. 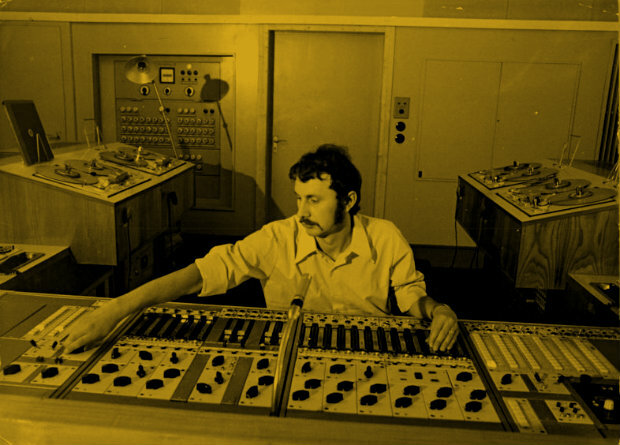 Now his job was to create the world’s largest and most sophisticated recording facility. It promised to be an ideal marriage of German functionality and Eastern decadence. The DRR gave him a generous budget and Ehrlich’s work turned out to be the greatest of his life. The halls and lobbies of the Funkhaus are built with limestone that came from the destroyed Reich Chancellery. The wide staircases are made out of three parts wood, stone, and carpet to capture the different sounds made by footsteps. The floors and walls are made of old-growth Russian timber– now some of the rarest material in the world. Triple pained glass separates the recording halls from the mixing booths to keep sound leakage to a minimum. In some studios, the walls are made of rotating triangular prisms coated with different materials for particular acoustic effects. And inside the walls is woven horse hair, because, why not? During its heyday, three thousand workers busied themselves here creating shows, symphony recordings, lectures, audio plays, and other works. Years before the Mauerfall the entire facility functioned as a mini-village with bars, clinics, a bookstore, kindergarten, grocery store, ice cream shop, dentist, barber, and sauna. Underneath its glamorous exterior, however, the Funkhaus was a high tension environment where censorship and spying were interwoven into social life. 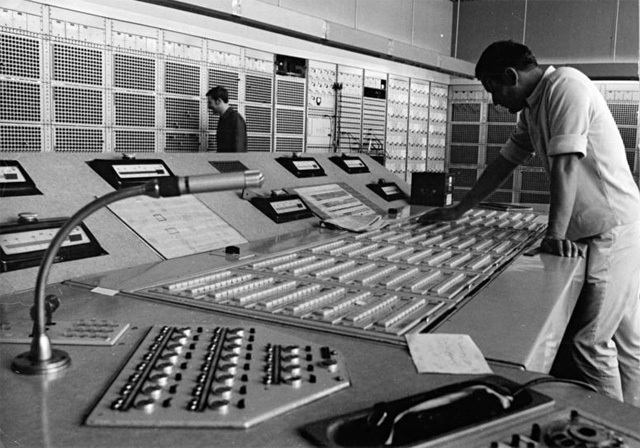 The STASI– the Soviet secret police force– had installed hundreds of intricate wiretaps behind every clock in the building to monitor Funkhaus activities. Today the antique clocks hang in the lobby in strange contrast to pictures of famous artists who graced the studio complex, like A-ha, Sting, and The Black Eyed Peas. The unique recording environments still attract a range of musicians from classical composers to soundscape engineers and the impressive exterior beckons to directors and production companies from around the world. The spacecraft sitting outside is a prop for the ongoing German TV series Terra Max. Like many places in Berlin, the history here has a heavy presence. But the low-frequency buzz of activity in the halls and studios reminds you that the Funkhaus is not an anachronism. It is a space where Berlin music history is still being written. A place where impressive works of art are still waiting to be made. If you’re into unique Bauhaus-soviet architecture, high precision audio, live-action-cold-war-recreations, or finding the best locations for ghost stories, the Funkhaus is worth a day trip. If you are a band or producer, you can rent one of the many unique rooms to craft your own masterwork, or if you just a curious visitor you can request a tour by clicking here.